Do You Faint When You See Blood? Are you one of those to faint when you see blood? Have you wondered what happens to you? Is it because you are weak or is it something else? Scientists are still researching for the exact cause for this, but, there are 2 theories which have come up explaining why it happens. According to Tyler C Ralston, a clinical psychologist in Honolulu, it is an evolutionary mechanism which has been passed down through generations. It is believed that, back then, when we were cave people, a genetic variation allowed certain people to faint in response to stabbing or cutting. This made their blood pressure drop preventing them from bleeding to death. Also, this response made them look dead which stopped the other cave people from actually killing them. This is called "Blood-injury phobia". Another explanation, which is more scientific, calls it the "vasovagal response". This response is caused by a trigger, in this case, the sight of blood. It causes a rise in blood pressure followed by a sudden drop in the blood pressure and heart rate which leads to reduced blood flow to the brain making you faint. Fainting to save your life is ok, but is it ok if you faint each time you go for a blood test?? Not really! So what can you do about it? You could either visit a therapist to help you overcome or practice "applied tension" technique on your own. 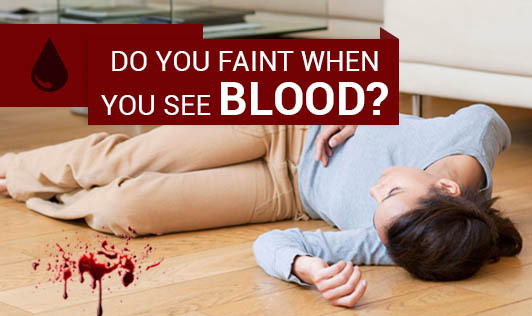 Now that you know what exactly happens when you see blood, will you faint or stand? ?